A zebrafish larva is an immature form of an adult fish. 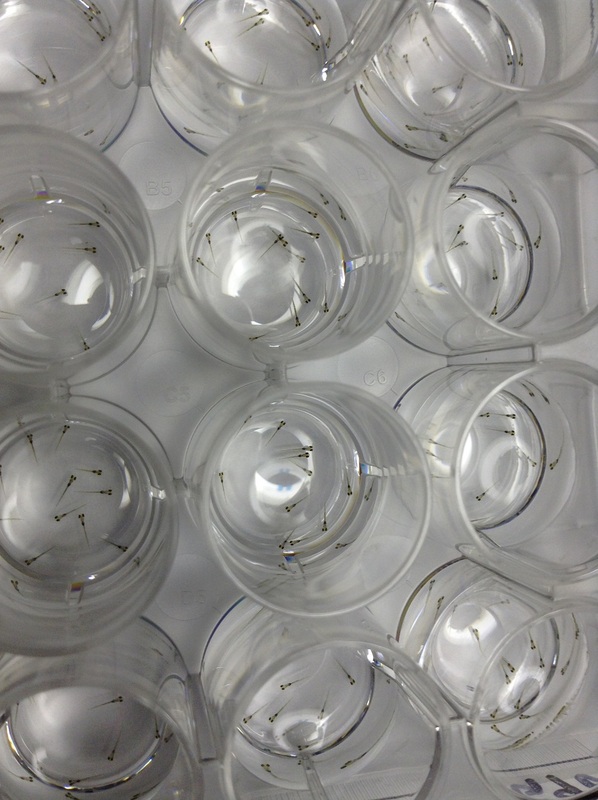 In this photo, you see a seven-day-old zebrafish larvae, around the size of a quarter, swimming in water. Approximately twelve larvae live in each small test well. Test substances, such as potential new medications, are dissolved in the water to determine whether they are safe and/or effective. The impacts that the test substance has on the larvae can be directly witnessed through a microscope or through automated behavioral analysis. In other words, because zebrafish larvae are transparent and develop quickly, researchers can actually see whether the substance added causes any changes. Scientists can also monitor behavior. For example, a test substance may cause a fish's activity to slow or increase, or their swimming pattern may change. Automated behavioral analysis uses computers to capture and measure these changes. These tests allow researchers to determine how potential drugs for humans affect specific organs and whether they behave as expected in living systems.